Charles de Steuben's Bataille de Poitiers en octobre 732 depicts a triumphant Charles Martel (mounted) facing Abdul Rahman Al Ghafiqi (right) at the Battle of Tours. The Celtic Cross in the background is an anachronism, such crosses being unknown at the time in the environs of Tours. Between Tours and Poitiers, France. Decisive Frankish victory, withdrawal of the Umayyad army. 20,000–25,000. Other estimates also range up to 80,000, with 50,000 not an uncommon estimate. Arab sources: about 50,000 in the beginning of the campaign. Estimated 1,500[بحاجة لمصدر], although sources unclear Estimated 12,000, although sources unclear. Most notably Abdul Rahman Al Ghafiqi. بعد غزو ايبيريا واصل المسلمين ف الشمال عبر جبال البرنييه لحد ما وصلو وسط فرنسا و غرب سويسرا. حملة عبد الرحمن الغاقى غزت مدن كتيره لحد ما وصلت بواتيه و جمعت غنايم كتير و إبتدا المحاربين يخافو ع الغنايم اللى جمعوها. كارل مارتل مد سلطته ف الجنوب. ↑ أ ب Tom oberhofer. 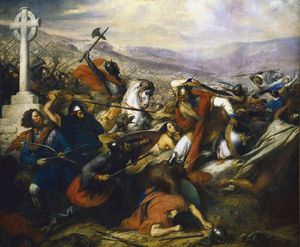 "battle of poitiers 729 battle of Moussais, battle of Tours, Charles Martel Eudes of Aquitaine, Abd. er-Rahman, medieval warfare". Home.eckerd.edu. Retrieved 2012-10-04. الصفحه دى اتعدلت اخر مره فى 19 نوفمبر 2017,‏ 12:07.